Microsoft prides itself on including many of its new products and features within its existing offerings. This is true for its analytics products: Power BI and PowerApps. While Power BI allows for integrating SaaS applications into common, shareable dashboards, PowerApps also allows organizations to build custom applications that support this data without having a highly technical background. If this sounds interesting to you, there’s good news! If you already pay for Microsoft products such as Office 365 or Dynamics 365 you may already have access to PowerApps. If not, it is probably still within your budget. PowerApps is generally licensed on a per-user basis meaning each user who accesses the service to create and run apps needs a license. Office 365 and Dynamics 365 customers can immediately benefit from the PowerApps and Microsoft Flow capabilities that these offerings include. Customers who want to build apps and flows that access data sources outside Office 365 and Dynamics 365, or need additional functionality, can purchase standalone subscriptions to PowerApps and Microsoft Flow. There are important differences in functionality between these groups of licenses. PowerApps capabilities for Office 365 and Dynamics 365 enable users to create and run apps within the context of these services. These apps can also be extended to leverage data in common cloud services including Box.com, Facebook, and many more. Users with access to PowerApps through Office 365 and Dynamics 365 can’t create or run apps against Microsoft Common Data Service databases. 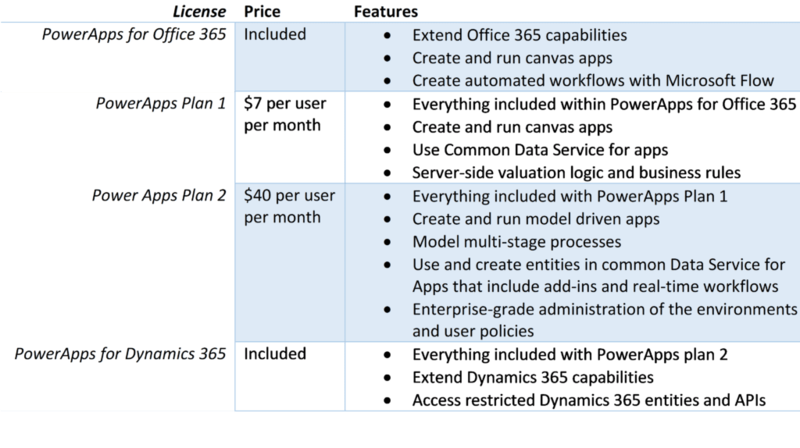 Most Office 365 licenses plans already include PowerApps. These Include Office 365 Business Essentials & Business Premium, Office 365 Education & Education Plus, Office 365 Enterprise E1, E3, and E5. This makes it very easy to start utilizing PowerApps within the context of Office 365. Programs like SharePoint Online, Teams, and Excel can be integrated with PowerApps to streamline processes and better leverage applications that you’re already using. In addition, if you don’t have PowerApps included within your current licensing, Microsoft allows for you to try out their premier product, PowerApps plan 2, as a trial for free. In short, you don’t have any reason not to get started with PowerApps and discover its possibilities. That’s not to say navigating licenses is easy. Often, learning that you are already paying for PowerApps is a far cry from fully utilizing its capabilities. At Peters & Associates, we can help! Our BI and Microsoft experts can educate you and your organization about how to best utilize PowerApps and train your users to understand the programs and applications within it. Reach out to our Chicago IT consultants! Email info@peters.com or call 620 832 0075 today.